Quick View Carrying Cases are molded in translucent polypropylene with a "window" for a quick view of what's inside. Secure lockable latches keep the contents secure, and easy-grip, molded handles make these cases easy to just grab and go! 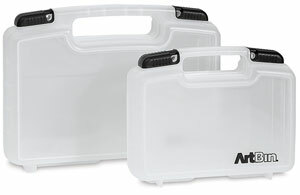 Carrying Case w/ Lift-out Tray — This model features a lift-out tray with 16 removable dividers.